The last few days have been full of negativity for me and with my current health condition I hardly can afford that. Its not a new thing for me that my pictures are being copied left right and center. Almost every week I get to know a new theft. Its not only about unassuming bloggers or internet users who thinks everything that comes on google search can be copied and used but by seasoned news papers and advertisement agencies who wants to save some money. There was a time when it gave me sleepless nights but now a days am learning to deal with it. I tried calling Bartaman, ABP, Times of India, Paroma and few ad agencies who used my pictures without my permission, without my knowledge. But in vein. They will never reply to my mails or complains, will keep the phone on hold for hours and leave you frustrated. 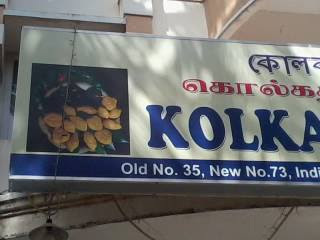 Not even that there are big restaurants like Oh Calcutta, or this sweet shop in Chennai who are using my pictures for their FB pages and in their hoardings. But when it comes to payment they prefer to keep silent. If that was not all then there are bloggers who crops images strategically and use for their pages and claims it to be their own. If you inform them they are offended and resort to calling names or will ask me to cry and plead to them for removing pictures. You think this is unethical, humiliating then trust me there’s more to it than am disclosing here. Fighting with them is a nightmare. I don’t wish to do that anymore. And now am scared too that it might happen one day that someone sues me for using my own pictures. But there are few good people also whose generosity touches my heart. When India Today or Map my India contacted me for few of my pictures, my joy knew no bound. Or this lady from an NGO, who wanted to use few pictures for their yearly calendar I was touched. I hardly received any money from them but still this acknowledgment makes me happy. Is that really big to ask for??? So here is a loud and clear announcement for all the bloggers, page owners and internet users. It takes a lot of time and energy to take pictures and no way am allowing you to use it. not copied from my page or through google. Its not an excuse for you to not know the basic blogging ethics, no not even if you are a new blogger. 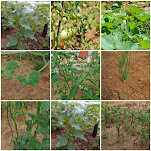 Google is a search engine that shows a collection of pictures collected from different sites to help you with your search and no way they are the owners of all the pictures that appear on their page. So just writing picture courtesy google images is not enough. If you wish to use my pictures then you need to take my written permission. Without which I will immediately report to the concerned authorities like Google or facebook and they will remove it within 24 hours. I am not doing it for money as hardly there is any earning for me from this blog. But am doing this to safe gourd my interest and to save myself from unwanted hassles. Would you allow your babies to be cuddled and parented by others? It almost feels the same. Sorry if I have hurt anyone’s sentiment by saying this but trust me after much deliberation I was compelled to write this. I feel blessed to have so much of love and support from you all and just wish to carry on the work I do without such nastiness to deal with. 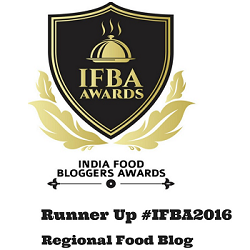 Now in a true food bloggers style here is one recipe to thank you all for everything. 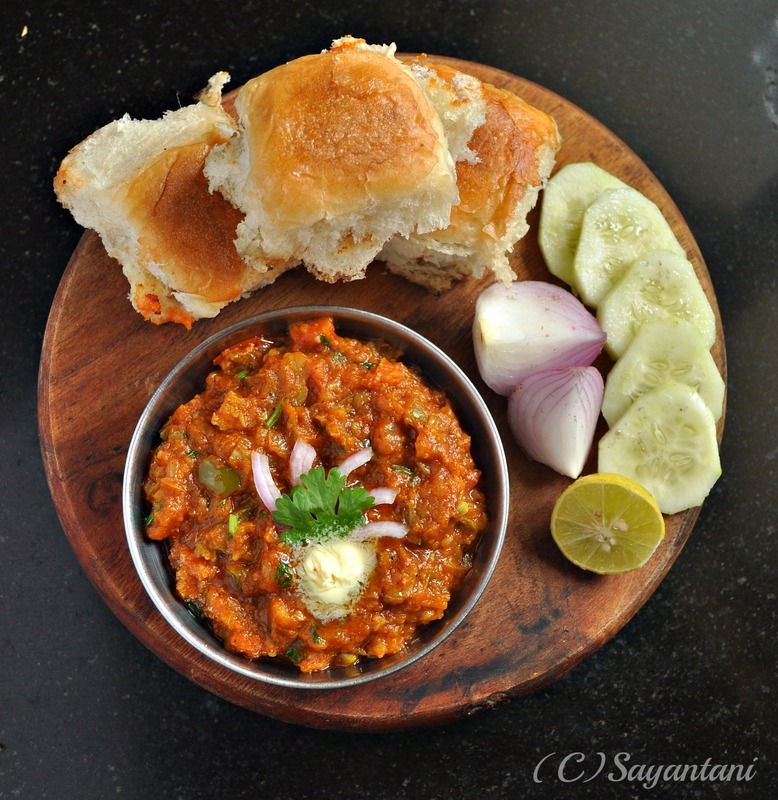 A very popular street food Pav bhaji basically from Maharashtra. This is a complete meal in itself with soft buttery pav or small dinner roll type buns and a spicy, tangy mixed vegetables called bhaji. Often it is served with fresh pieces of cucumber and onions to balance the spiciness of the bhaji. Like many of you this is a family favourite for us as well. We loved standing on the street to mop this almost tongue burning hot and spicy bhaji with pieces of buns smothered with extra maska or butter. Till I discovered this pav bhaji masala from Everest and the recipe on the pack. I tried it and it was a winner all the way and became a regular at my place. Most of the times I make it less spicy than the recipe am sharing here. But there are days when you want the real thing, dripping with butter, red with chilies and piping hot. For those days use this recipe and for days when you want to eat healthy go easy on the amount of spices and butter. Tomato: 2 big (chopped 1 cup); take the red ripe ones for the tang and coour. Kashmiri red chili powder: 1 tsp for extra colour. Peel and cut the potatoes and carrots in cubes. Wash along with the cauliflower florets and keep aside. Finely chop the onion, tomato and capsicum. Keep everything separate. Take the potato, cauliflower, carrots and peas in a pressure cooker with a pinch of salt and 11/2 cups of water. And cook on high for one whistle. Let the steam dissipate and carefully open the lid. Keep aside till required. Heat the oil and 1 tbsp butter in a heavy bottom kadai or pan. Add the onion with a pinch of salt and cook on medium till they are soft (4-5 minutes) add the garlic paste and chili powder. Cook by stirring for another couple of minutes till the raw smell of the garlic is gone. 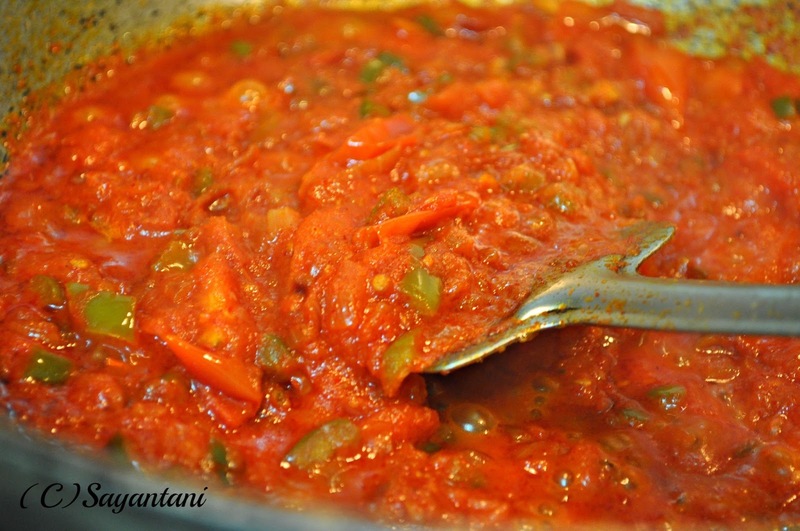 Mix in the tomatoes, add salt as per taste and cook covered till they are all mushy and mixed (5-6 minutes). Add the chopped capsisum and cook for a minute before adding the pav bhaji masala. Mix everything together and cook for a minute. Then mix in all the boiled vegetables. 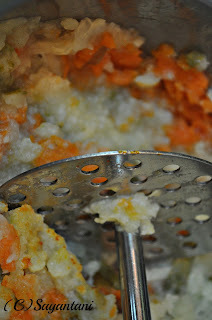 With a vegetable masher or a slotted spoon start mashing and mixing the vegetables. Don’t make a smooth paste, keep little pieces intact for texture. Add the butter and cook on medium till the water evaporates and you get a thick but not dry mixture of spices and veggies. You need to cook this at-least for another 7-8 minutes for all the veggies to absorb the spices and the aroma. If needed add ¼-1/2 cup more water for proper cooking. Serve hot with buttered and lightly toasted pao breads and fresh cucumber, onion and wedges of lemon. I prefer to add 1 more tsp of extra butter on each plate. For a lighter version go easy on butter, chili powder and spices. You can any vegetable like cabbage or beans but balance the taste with tomato and chilies. 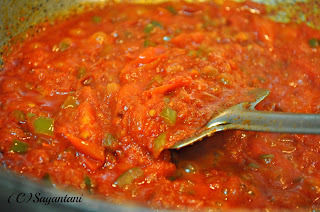 pav recipe, recipe pav bhaji, bhaji recipe, pav bhaji masala, everest pav bhaji masala, pav bhaji recipe, masala pav recipe, indian pav bhaji, pav bhaji mumbai, bombay pav bhaji, how to make pav bhaji, pav bhaji recipes, bhaji pav recipes, street style pav bhaji recipe, pao bhaji, pau bhajji recipe, laadi pav and bhaji, mumbai famous snack recipe, Kolkata street food recipe, cauliflower recipe, spicy tangy pav bhaji, rich and buttery pav bhajji recipe, how to make spicy bhaji, bhaji recipe. 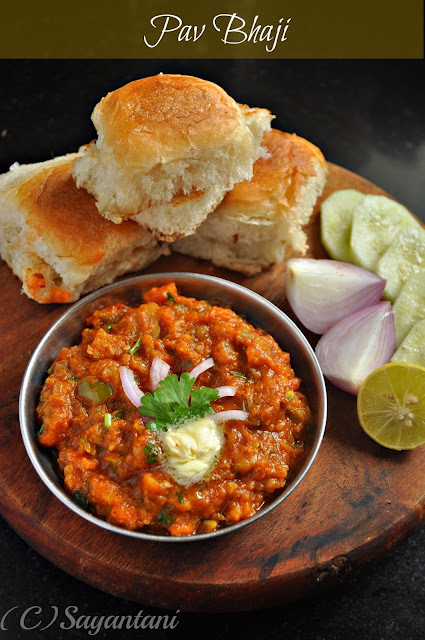 Wow..pav bhaji looks so inviting and yummy. My alltime fav dish. Beautiful click. Yes Sayantani. We move on with good food and better pictures. There is no end to theft and burglary sadly and we all keep seeing that everyday. So true ! I am also facing the same problem . There is one site called DesiChef who took hundreds of my recipes and pics and posted on their site without backlink. When I asked them to remove that's all in vein. 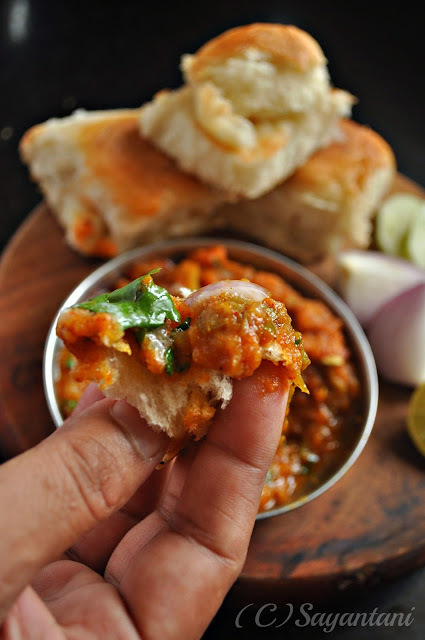 Anyways loved this tempting Pav bhaji and the melted butter looks yum! Thank you everybody for this support. it means a lot to me. feeling to go back to Mumbai..
yummy and awesome pav bhaji. My all time favourite dish!! !And the pictures looks so perfect! Yeah it's really frustrating. I have faced the same problem several times. Anyways the pav bhaji looks tempting. Want to grab a piece...drooling..
this is really irritating sayantani.. once published on internet everybody thinks they can do anything with our stuff..
what you mention is every blogger's issue. no amount of contacting or emails help. its a waste of time. better to be creative and keep on doing what we love. Hi Sayantani, Thank you for visiting Crochetkari. You have a fantastic blog with some yummy looking recipes. Your photos are too good. 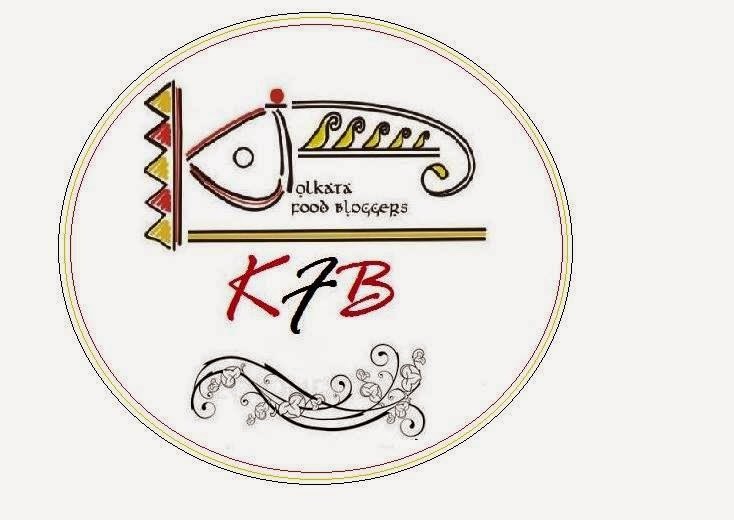 I have always wanted to try Bengali cuisine, so I will be visiting frequently for sure. Feel free to drop a line if you have any crochet queries. Love the look of that pav bhaji Sayantani - thats a beautiful click. Really feel terrible to hear of how people so shamelessly copy your work. Would it help to have a watermark across the pic or something ? But you should write to them whenever you see it copied. They should know that people will not let it go unnoticed. Your pics are really really good and maybe the only positive from this is that they are getting copied because they are so good. Keep up with the great work and enjoy what you are doing..
one of my favourite recipe, looks so delicious. Every blogger's problem is wat u told Sayantani, we are all facing the same problem since a long, watever we do,everything fails and am getting fed up with these issues. 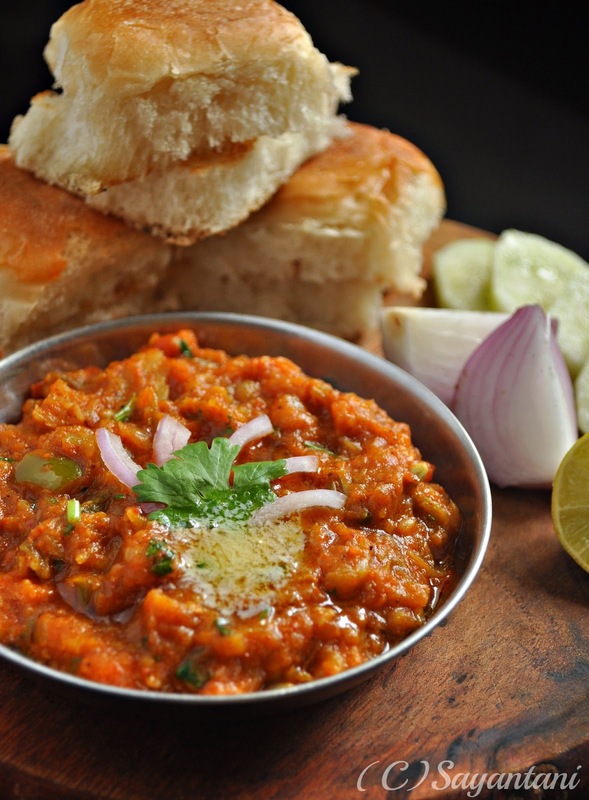 Droolworthy pav bhaji,you are tempting me a lot. I hear ya on the photo theft. It is very frustrating and I can't believe it happens with established newspapers too. My friends and family always tell me to just feel flattered that my work was stolen instead of wasting energy on being frustrated. More easily said than done though. Thanks a lot for dropping by my blog Sayantani. I am amzed by your pictures and recipes. Seems like I missed a beautiful space all these days! Happily following you ! Great looking pav bhajis ! Looks absolutely delicious and inviting. Yummy!! Nice pav bhaji, Add Pili Nuts to it, this will become tastier and healthier. В современное время масса людей отдает предпочтение tv онлайн, потому что каналы, транслируемые на обычном телевизоре, не всегда удовлетворяют потребности искушенного и современного зрителя, который стал продвинутым и выбирает для себя все самое лучшее. Особенно это касается программ о спорте. Трансляции по ТВ идут редко, иногда они показываются в ночное время, часто о прошедшем чемпионате только можно услышать отдельные фразы на телевидении. Что делать? Выход имеется – посетить наш портал, где собраны различные спортивные каналы. Достоинство просмотра спортивных мероприятий в онлайне является и тот факт, что можно при просмотре поделиться впечатлениями и обсуждать игру с остальными любителями спорта. А это ведь так здорово! Пользуясь нашим сайтом, вы будете в курсе основных мировых спортивных событий, не пропустите никогда ничего. Наши каналы показывают полностью бесплатно, режим трансляции – круглосуточный. Наш портал работает везде, только необходимо зайти на его адрес – и вы в гуще футбольных чемпионатов, бокса, бега, лыжных сотязаний и всех видов спорта, которые вам по нраву. I literally started having hunger pangs halfway through the post. It looks amazing and I bet it also tastes delicious too. It is the perfect dish to satiate our hunger pangs in this rainy month. I can’t wait to try it this weekend. Looking forward to reading more delectable recipes in the upcoming posts. OMG you are an artist, trust me!